Instantly elevate the look of your kitchen or dining room with the contemporary Meredith kitchen set. Whether you're enjoying family dinners or entertaining friends, this sleek five-piece set provides a comfortable seating and dining area and includes a table and four chairs. 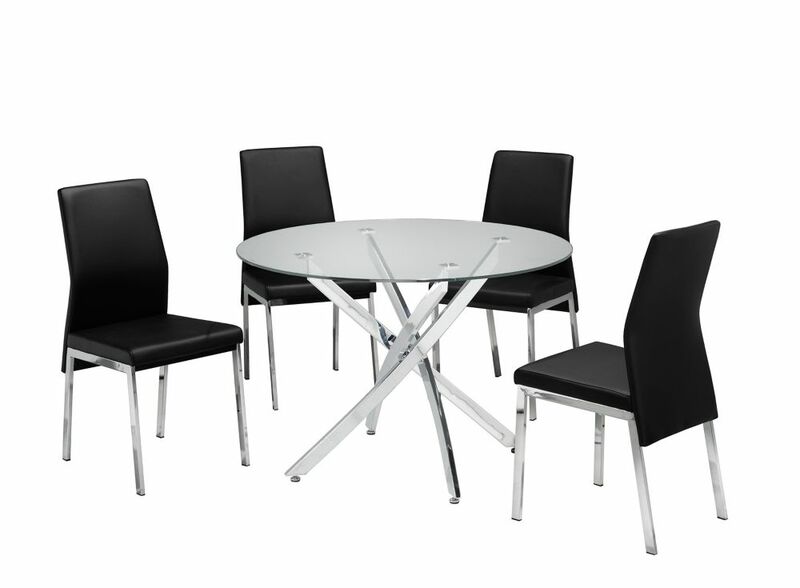 The elegant table takes center stage with a sturdy 12mm tempered glass top and eye-catching modern chrome plated legs. Covered in an easy-to-clean, neutral espresso coloured fabric, each of the four chairs offers comfortable padded seating with a fashionable curved seatback design. The chic chrome plated legs of the chairs coordinate with the table base for a clean, modern aesthetic that works effortlessly with most colour schemes. Expertly constructed from solid wood, this dining chair exudes style using subtlety. The lack of unnecessary ornamentation gives this dining chair a timeless and contemporary feel while the carefully contoured seat and gently angled backrest keep you comfortable. Meticulously finished throughout, even the underside is finished in the same beautiful cappuccino stain finish. Crafted from solid wood, this dining chair is expertly designed with a contoured seat and gently angled backrest that perfectly combines comfort and style. The deep, rich wood grain gives this dining chair a subtle look that complements any home decor. Meticulously finished throughout, even the underside is finished in the same beautiful cappuccino stain finish. This solid wood dining chair is expertly designed with a contoured seat and gently angled backrest that perfectly combines comfort and style. The deep, rich wood grain seat complements the cream legs and backrest that give it a beautiful look that works with any decor. Meticulously finished throughout, even the underside is finished in the same beautiful walnut stain finish. Crafted from solid wood, this dining chair is expertly designed with a contoured seat and gently angled backrest that perfectly combines comfort and style. Crafted with a high attention to detail , the deep rich wood grain seat is meticulously finished throughout, even the underside is finished in the same rich wood grain. Alexis 5-Piece Kitchen Set 1 Table + 4 Chairs Black Instantly elevate the look of your kitchen or dining room with the contemporary Meredith kitchen set. Whether you're enjoying family dinners or entertaining friends, this sleek five-piece set provides a comfortable seating and dining area and includes a table and four chairs. The elegant table takes center stage with a sturdy 12mm tempered glass top and eye-catching modern chrome plated legs. Covered in an easy-to-clean, neutral espresso coloured fabric, each of the four chairs offers comfortable padded seating with a fashionable curved seatback design. The chic chrome plated legs of the chairs coordinate with the table base for a clean, modern aesthetic that works effortlessly with most colour schemes.